This piece is by Nate Hawthorne, a friend and comrade to many of us in Black Orchid Collective. He’s a member of the Industrial Workers of the World and is one of the editors of a web site called Recomposition. He writes on his own at this libcom blog. 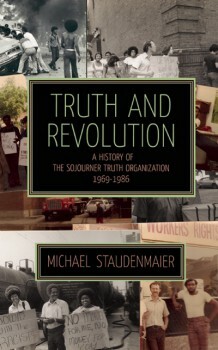 This is his reflection based off of Mike Staudenmaier’s new book, “Truth and Revolution: A History of the Sojourner Truth Organization.” Nate’s views do not represent the views of BOC. In fact, we are only now reading and discussing this book. BOC has been heavily influenced by the writings of STO and they have helped frame our strategy and tactics in the recent struggles we have been involved in. Please look out for our discussions when we post them online! A central character in John Dos Passos’ novel The 42nd Parallel is Mac, a working class man who gets radicalized and joins the Industrial Workers of the World. At the same time that Mac becomes a radical organizer, he begins a relationship with a young woman named Maisie. While making plans to marry her, Mac repeatedly doubts his relationship with Maisie, seeing the relationship as a source of pressure that might lead him to “selling out to the sonsofbitches” who run and profit from capitalist society. Mac proclaims his love for Maisie in a letter where he tells her he has left for a long-term trip to Goldfield, Nevada to help an IWW organizing drive. While Mac is in Goldfield, Maisie writes to him asking him to come back home because she is pregnant. Mac tells a comrade that he plans to return to Maisie, but the other man tell him that his first duty is to the working class and that as a revolutionary he should not have a wife and kids. Mac agrees to stay even longer than he planned. Dos Passos’ depiction of Mac’s involvement in the IWW is well researched and sympathetic, but he doesn’t flinch from depicting these ugly realities. Unfortunately, this dynamic was not just fiction. I thought of this moment from Dos Passos recently while reading Mike Staudenmaier’s excellent new book Truth and Revolution A History of the Sojourner Truth Organization, 1969–1986. (Buy it, it’s great. You can get it here.) There’s a lot to recommend the book; it gives an overview of important aspects of mid-to-late 20th century U.S. political and social movement history and the radical left; it provides a detailed account of the working of a small radical group that’s about the size of many of the groups on the left today and there’s a lot we can learn from reading about a group like the ones we’re part of; it gives a good overview of important theoretical points with regard to race, marxism, and organization. In this review I want to take the book as a jumping off point for a discussion of politics and parenting. At one point in his book, Staudenmaier discusses a conversation that opened up in STO about parenting. (If there are similar discussions in other books, about left organizations’ responses to parenting, I would love to hear recommendations.) The first people in STO to become parents felt uncomfortable in the organization and ultimately left; their departure was tied to intense political disagreements so it’s hard to say how much of that was motivated by political views and how much by personal concerns. (The fact that that distinction makes sense speaks volumes, however.) One member later estimated that at one point 1/4th of STO’s members had children. STO was always a small group, however; they probably peaked at 100 members. which means that at their highest point of having parents as members there would not have been many parents in the organization. In 1980 an ongoing argument about gender, sexuality, and feminism in the organization opened up into a conversation about how appropriate it was for communist revolutionaries like STO’s members to have children. Several parents wrote about this, defending themselves as parents and radicals. One member with children suggested, rightly in my view, that parenting did limit people’s abilities to do political work, but added that this was true of any important relationship or commitment people had other than politics. He pointed out that the organization had faced a good deal more drama due to people’s romantic relationships but no one in the organization suggested that communists must be celibate. Sexuality was taken as a legitimate human need despite the costs – and in my experience on the left the costs of people’s interpersonal decision in sexual relationships are often minimized or swept under the rug instead of owned up to directly – while parenting was taken by some to be an unnecessary hindrance and not a legitimate need. Another member argued that parents in the organization were held to a higher and unfair standard compared to nonparents – missing an organizational event for personal reasons was a bigger problem when that reason was parenting related. I should say, the STO members who wrote on these matters were responding more to an atmosphere and an undercurrent than to clear positions. Staudenmaier suggests that this was a one-sided debate, not because the parents were unduly defensive but because the other positions were never clearly and directly stated in such a way that they could be engaged with head on. Some parents in the organization tried to point out ways that parenting actually made them better as people and helped them developed qualities that made them or would eventually make them better revolutionaries as well. As a parent of a young child, agree with those points but they strike me as rather abstract and misleading. Parenting really is a lot of work and it really can be quite difficult to be a good parent and a good… well, anything else. And it’s particularly difficult to be good at activities that are largely the terrain of (and largely structured around the priorities of) childless people. In the Dos Passos novel that I opened with, Dos Passos describes a speech by IWW leader Big Bill Haywood. “The workers must realize that every small fight for higher wages, for free speech, for decent living conditions, was only significant as part of the big fight for the revolution and the co-operative commonwealth.” (120.) This reflects the IWW argument about building the new society in the shell of the old – waging struggles against the capitalist order now in such a way that lays the groundwork for a new society. STO was influenced by the legacy of the IWW, wrote about it, and developed some ideas in parallel to IWW ideas. Among those ideas was the view that participation in collective action had the potential to transform working people and radicalize them. Action alone wasn’t sufficient, radicals still needed to engaged with people about ideas, but action was a precondition for radicalization. Upon hearing that speech by Haywood, “Mac forgot about Maisie,” Dos Passos writes. (120.) Some of the time the emphasis on radicalism and action is not only anti-parent but encourages a worsening of the gendered division of labor in shared parenting workload. Staudenmaier does not discuss this in relation to STO; I would imagine that former members would be hesitant to discuss something like this as it’s quite personal, but I would be shocked to hear that it never happened. The sensibility of the early IWW and of STO’s emphasis on direct action reminds me of a remark from Marx and Engels’s German Ideology, where they refer to communism as “the real movement which abolishes the present state of things.” Traditionally this vision of communism is distinguished from the vision of a communist society, made up of people who are “freely associated” in labor and other relationships – that is, free from external constraints like those imposed by money and the need to get money to buy needed goods and services. As Marx and Engels wrote in the Communist Manifesto, “In place of the old bourgeois society, with its classes and class antagonisms, we shall have an association, in which the free development of each is the condition for the free development of all.” It makes sense to distinguish the movement of abolishing capitalism from the creation of a new “association” of free humans. We should not overestimate our ability to live in freely associated fashion under capitalism. At the same time, it is important to try to make our “associations” with each other as free – as liberatory – as possible now without limiting our abilities to collectively hasten the abolition of the present society. Often in our actual practices, however, the free development of some people is not created by the free development of all but rather comes at the expense of others. We can see this in a classic formulation from feminist criticisms of the left, that men often did the intellectual work of writing leaflets and pamphlets and planning how to use them, while women did the work of typing and copying and assembling the pamphlets. That not only made women do the less enjoyable work, it stifled women’s chances to use their creativity and abilities and to develop themselves further as radicals. I thought about writing this article in part because of reading Staudenmaier’s excellent book (and I really do recommend it highly, there’s a great deal in there that speaks to present issues and concerns, I think we on the left should read it and discuss it collectively) and in part because of difficulties I’ve had as a parent and a radical. This was crystalized recently for me when I went to a political meeting on a day off work. I work long hours at my job. My wife and daughter and I were talking in the morning about our day. My daughter asked me if I was working that day. I said that I wasn’t. She said “daddy’s not working, mama.” My wife said, “I know, so what should we do today?” Rather than talk about how to spend our time, though, my daughter first wanted to dwell on the fact that I wasn’t working. She said “daddy’s not working so he’s not going to teach and he’s not going to the library and he’s not going to a meeting.” My heart sank a bit at that. I hoped that my wife’s plans to take our daughter to the beach would coincide with the meeting I was going to after dinner. We all had a nice day, managing to balance housework (I finally got all the dishes washed) and playing together, and I cooked what I thought was a good dinner (my wife liked it, my daughter was less keen). After dinner, I put my shoes on to go the meeting. My daughter said “where are you going daddy?” I said “I have to go to a meeting.” She said “but you’re not working today.” I said “it’s not a work meeting.” She said “why are you going? Do you want to go?” At that moment, I really didn’t. I said “well, it’s important that I go, it’s an appointment.” She didn’t reply. On my drive to the meeting I felt frustrated for giving up this time with my young daughter, for my sake and for hers, and for increasing the parenting work that my wife has to do. She values parenting but it’s hard and my work hours mean that she does more of it than I do. At least some of the time, devoting time to left stuff means that I’m asking her to do even more of it, which at least to some extent comes at the expense of other things she could be spending her time on, or simply spending time together as a family. Like I said above, as an STO member pointed out, parenting, like any relationship someone is committed to, really does come at the expense of political involvement. And the reverse is true… In the depths of my bad mood while driving to the meeting (the meeting was great, by the way, very productive and I’m glad I went; I rarely do at this point), I thought that for me at this point my life it really is an either/or much of the time between being a good parent and a good partner vs making contributions as a radical. That’s difficult, because, to quote the STO member’s wife I quoted before, “I intend to be as good a parent as I can.” It’s rare that left politics is practiced in such a way that the “free development of each is the free development of all.” I don’t now what that would look like with regard to parenting. To put a finer point on it, it’s clear what it looks like when left politics makes people worse partners and parents. It’s somewhat clear what it looks like when people more or less adequately manage the balancing act between left politics and parenting and partnering. It’s not at all clear, at least to me, what it might look like if left politics was practiced in such a way that it actively made people better parents and better partners, and enriched the lives of the children involved. I am, frankly, skeptical of the degree to which this is feasible. This is not unique to the left, though I think the left is probably worse at it than some other institutions. Currently in our society it’s hard to do parenting and much else well. To begin to come back to STO and Staudenmaier’s fine book, I think it’s worth having conversations about how organizational practices that seem unproblematic can actually be problematic. Many of us are familiar with this regarding issues like gender. Staudenmaier uses the phrases “premature universalism,” which is thought provoking. I’ve written a bit about a similar thing in Occupy, about ways in which “we are the 99%” can (but doesn’t have to) draw the lines of who “we” are in ways that exclude people. Similarly, activities that fit well with some people and the rhythms of their lives can feel natural and sensible for all involved, but not at all work for other people’s lives. My favorite (or least favorite) example of this is consensus decision-making processes in meetings. I have and friends of mine have repeatedly been involved in efforts that use this process in ways that lengthen meeting times greatly without increasing the actions that result. For people with the time, and especially for people for whom movement involvement is a lot of their social life, the deliberative aspect of consensus is a good in itself. For people under more time pressures who can’t stay for longer meetings, or who just don’t want to be in longer meetings, the result has been exclusionary. While all of this portrays STO in an unflattering light, I want to say that STO members and the group as a whole accomplished a lot, as detailed in the book. There’s a lot of in the book to learn from and a lot to draw from the experiences and writings of STO. I’ve focused on some of the limits of STO here, but those limits make the book all the more important. We learn more from failings than from successes, much of the time. What about childcare? Why isn’t this taken into account by the group? In many projects, leftists have taken this into account and try to structure their organizations and lives accordingly. Also, why is the issue of treated as taking care of people who need extra help? In other words, as a personal problem? Why not see the nuclear family as a political issue? Rather than a personal choice? This would advance the critique of capitalist society, to explore how it is organized in such a way as to fracture the common into individual/personal problems. Thematically, it could address issues like the lack of childcare, the gendered division of labor, and reproductive labor in the reproduction of capitalist society and value production. I think there are many good examples of groups who thankfully have gone beyond the STO in these regards. That all the STO members with kids eventually left the organization reveals a serious failure of that group to grapple with the reality, not just of its members, but of the society it is living in. How do you expect to build a mass movement when you can’t even adequately grapple with the concrete material situations of your own members, when it is right in front of your nose? Why not see the nuclear family as a political issue? Rather than a personal choice? This would advance the critique of capitalist society, to explore how it is organized in such a way as to fracture the common into individual/personal problems. This is a question I have been thinking about recently and is really overlooked, in my view. As a parent of an 8 yr old, and one on the way, I sympathize quite a bit with the issues Nate lays out in this piece. Tbh, I have not read the new Truth and Organization book, although it is definitely on the to-read list. Nor have I read much of the material I mean to get to on the subject. But in some of the contemporary pieces it arises, it definitely seems a rather shallow analysis rooted in personal choice rather than the social institution that people are compelled toward. Recently, a local reading looked at this piece, which to be fair to that author, isn't intended as an analysis of "the family" per se. But it drew out a discussion that revived for me a desire to see and understand a more substantive cultural/political/economic understanding of having kids and being a militant, or whatever your preferred nomenclature. So, for example, what concepts like patriarchy, heteronormativity and the nuclear family actually mean in relationship to those of us who are trying to live lives free of oppression (insofar as one tackles that on personal level), but still, you know, living our lives with our own families. Here is a recent piece I enjoyed talking about the issue within Seattle Solidarity Network. You seem to be talking about the group as if they still exist? If not, sorry my bad for interpreting it that way. But I thought this piece was mostly interesting to learn from the lessons of this group that had made mistakes, or could have done better. I imagine many past revolutionary groups are examples of what not to do. This varies a lot by parent and situation but personally I have little interest in and would make little use of childcare. I have too many responsibilities that pull me away from time with my kid (let alone time that I'm fully devoting to actively interacting with her, as opposed to sort of sitting nearby her while multi-tasking). So the most important issue for me is not that I need someone to care for her so I can do other stuff. The issue is that I need a reduction in the other stuff I have to do. why is the issue of treated as taking care of people who need extra help? In other words, as a personal problem? Why not see the nuclear family as a political issue? Rather than a personal choice? This would advance the critique of capitalist society, to explore how it is organized in such a way as to fracture the common into individual/personal problems. I agree, though personal problem vs political problem is something of a false dichotomy. I'm less interested in advancing a critique than I am in practicing and seeing practiced a response (one that's helpful) to these social dynamics as they manifest in my life. One doesn't necessarily have to come at the expense of the other - the critique can be advanced and the practice... ummm... practiced - but to my mind dealing with the practical issues are more difficult and practical responses are much less developed than the theoretical critique. At least for me personally (I've read a lot on reproductive and domestic and unwaged labor in theory and historically etc, I've read very little in the way of useful short term stuff that can be put into practice for people like me). I have little interest in and would make little use of childcare. I have too many responsibilities that pull me away from time with my kid. [...] So the most important issue for me is not that I need someone to care for her so I can do other stuff. The issue is that I need a reduction in the other stuff I have to do. (1) I meant childcare as something organized by the political group you are involved in and already want to attend meetings of. This would enable you, or your partner, to attend meetings, which you're already doing or want to do. This would also help connect the "personal" and "political" lives. (2) Reducing the other stuff you have to do is more of a political question, if I understand you correctly (ie. too much time spent on wage labor, for example). I'm less interested in advancing a critique than I am in practicing and seeing practiced a response (one that's helpful) to these social dynamics as they manifest in my life. I am not sure the critique and practice are so separate. If people in a group think parenting is "unnecessary" and "inappropriate", then they aren't going to have a good practice on kids, parents, etc. And vice versa. I just learned of a radical left political group that has been doing collective childcare for 15 years. It started as a practical measure when some of the founders of the group had had children. now there are 20 kids in the group and they take care of their members. They make sure the parents have the chance to participate. *And* they are one of the most long-standing groups in the city. Instead of a hindrance to political work, the group's experience shows that an adequate collectivity can strengthen the group. I think we're on the same page here. In terms of this particular meeting though, childcare wouldn't be feasible because of the length of the meeting and the age and temperment of my kid. I definitely think reducing total workload is a political issue. I suppose what I'm fumbling for here is that I'd like to see *that* taken up politically. For me personally, a political organization providing childcare doesn't do much for me, whereas an organization offering help with, say, washing dishes and doing laundry would. To put it schematically, childcare is for me the least or one of the least alienated labors I do (and this is different for people who work less hours at other work and who have more childcare time than they prefer). I'd rather alleviation of the worst/most alienated of my total labors, or just other ones. I think we're on the same page here. In terms of this particular meeting, childcare wouldn't be feasible because of the length of the meeting (I think it was like 3 1/2 hours long and actually I think almost every minute of it was productive and needed, it was actually one of the best things I'd been to in a very long time), and the age and temperment of my kid. I think for the foreseeable future this stuff will remain incompatible for people in the US with kids the age of mine - the social practice of parenting here is isolating and other activities are generally practiced in ways that are hard to balance with parenting. I don't think this is the left's fault and I think the left's ability to overcome is going to be limited. I had somewhere I was going with this but I lost my train of thought... ugh. Oh well. I definitely think reducing total workload is a political issue. I suppose what I'm fumbling for here is that I'd like to see *that* taken up politically. For me personally, a political organization providing childcare doesn't do much for me, whereas an organization offering help with, say, washing dishes and doing laundry would. To put it schematically, childcare is for me the least or one of the least alienated labors I do (and this is different for people who work less hours at other work and who have more childcare time than they prefer). I'd rather alleviation of the worst/most alienated of my total labors, or just other ones.